To say that the Artisan Bread in Five Minutes a Day method changed the way I bake bread for my family is an understatement, because suddenly we had buckets of dough hanging out in refrigerator rather than containers of sourdough starter. My starters always seemed temperamental, or more likely I didn’t do such a good job tending to them. A few were downright neglected and showed it when I opened the containers. 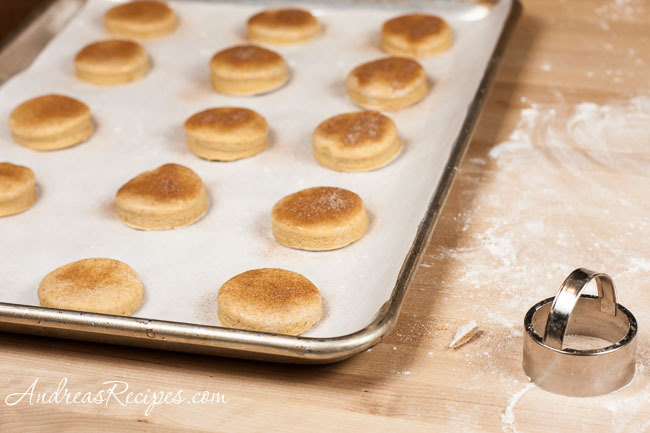 This method felt so much easier because the flavorful doughs were ready to go, with no long waits to grow a starter or dealing with preferments; I just cut off a hunk of dough, shape, rise, and bake. I experimented with whole grains using Zoe and Jeff’s original formula because we prefer whole grains in our breads, and fortunately for their readers they put in a lot of work and came up with some fantastic ideas for whole grain breads using the same minimal mixing/no kneading method, and the result is the newly released Healthy Bread in Five Minutes a Day. The book has 10 chapters, and the first four are devoted to fully explaining the method, with information on ingredients, equipment, and tips. If you want to make good bread, don’t skip these chapters. It won’t take long to read them and the reading will prepare you for making your first beautiful loaf. You’ll learn that you don’t need expensive equipment to make good artisan-style bread; this is one cooking area in which less is more, no bread machines or mixers required. The book is perfect for beginning bread bakers because you learn to focus on the dough without a lot of fuss. 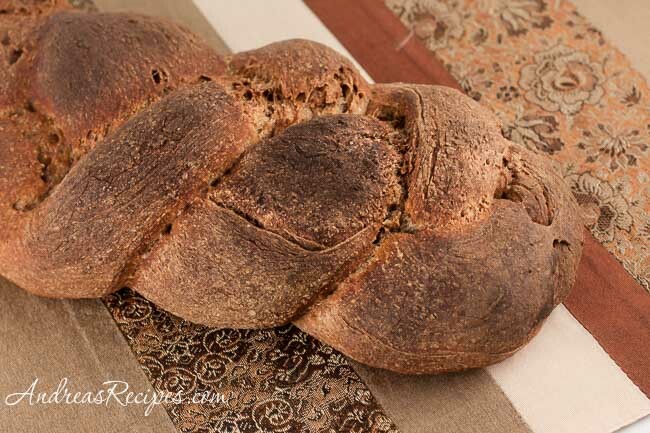 In addition to the master recipe, there are recipes for other whole grain breads, bread with fruits and vegetables, flatbreads and pizza, gluten-free breads, and enriched breads such as brioche and stollen. The book makes use of a variety of whole grain and gluten-free flours: whole wheat flour, rye, graham, oats, bulgur, barley, wheat germ, spelt, emmer, buckwheat, cornmeal and masa, mesquite, millet, quinoa, rice, sorghum, soy, tapioca, and teff. Vital wheat gluten is an important ingredient used in the whole grain loaves to help maintain structure and texture, though it is omitted in the section of gluten-free breads for people with gluten allergy. We’ve made several of the breads since receiving a copy of this book for review and have found more than a few favorites. 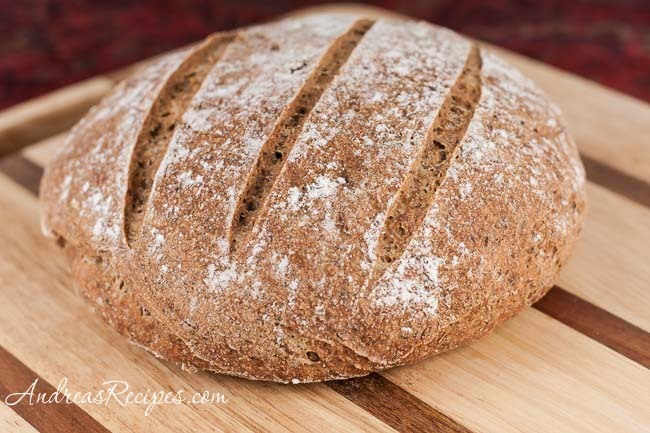 My family thought the flavor and texture of the Whole Wheat and Flaxseed Bread was terrific. The addition of flaxseed adds important nutrients to the bread, including fiber, protein, magnesium, phosphorus, zinc, and Omega-3 fatty acids. Rye breads are probably our favorite kind of loaf, and the thought of braiding rye and pumpernickel together was just too tempting. The pumpernickel color isn’t as dark as our favorite pumpernickel from Harrison Bakery in Syracuse, so I’m going to experiment with more ways to deepen the color. I recommend letting these doughs sit in the refrigerator for at least two days for better flavor, and if you can possibly wait a little longer, the flavor gets better the longer it sits. We took Zoe and Jeff’s idea for pumpkin brioche donuts and cut mini donuts, sprinkled them with spiced sugar, and then baked. These little things are addictive. Whether you are new to baking bread or are a seasoned baker, Healthy Bread in Five Minutes a Day will help you to get more whole grains into your diet and even save you money on expensive store-bought loaves. 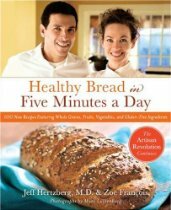 Both Healthy Bread in Five Minutes a Day and Artisan Bread in Five Minutes a Day are very worthwhile to add to any collection of baking books. Thanks for the review. I reviewed the book on my blog as well. I really love this book. Thanks for the great idea about baking the doughnuts instead of frying.